Transat A.T. Inc. and its affiliates (hereinafter « Transat ») are committed to protecting your privacy. As a tour operator, distributor of travel services and air carrier, we attach particular importance to protecting the personal information that you share with us and we strive to maintain your trust in this regard. The objective of this Personal Information and Privacy Protection Policy (hereinafter the « Policy ») is to provide you with information about the manner in which Transat collects, uses and shares your personal information, the options you have in this respect and how you can access and rectify your personal information if necessary. This Policy was developed to comply with the requirements of the privacy protection legislation in force. We have developed and implemented internal policies and procedures designed to provide adequate protection of the personal information in our possession and we review these on a regular basis. We educate our employees about the importance of protecting personal information by providing them with training on this topic and by regularly issuing guidelines that emphasise their role and obligations in this respect. We take reasonable measures to ensure that our agents, mandataries, representatives and other external organisations comply with this Policy (e.g. airport service providers, incoming tour operators, hotel operators, administrative support, data processing and data storage companies, payment processors, etc.). We have a dedicated employee responsible for issues of protection of personal information. For the purposes of this Policy, « personal information » refers to any information that could allow an individual to be identified, such as an email address, telephone number or any medical or financial information. We collect your personal information in several ways, including when you reserve or purchase travel services, contact Customer Relations, complete an in-flight survey or participate on our social media sites. Details about a problem you experienced. For any other purpose as required or permitted by law. 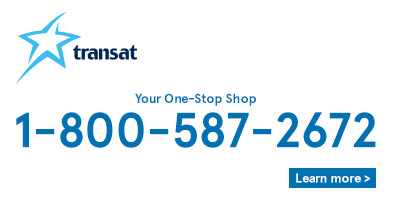 Your personal information may be shared among Transat's affiliates as part of providing the travel services. Such information may also be forwarded to the third-party providers with which Transat conducts business from time to time and these third-party providers may contact you to send you personalised offers for products and services. Transat is not liable for the use or sharing of personal information that you provide to third-party providers and may not be held liable for the policies, procedures, or practices of such third-party providers with respect to protection of personal information. We have implemented a combination of material, organisational and technological means to ensure the confidentiality of the personal information that we hold, to protect such information against loss or theft and to prevent any unauthorized access, transmission, reproduction, use or amendment thereof. When we share personal information with a third party, we take appropriate security measures to ensure such third party’s compliance with the undertakings and rules set forth in this Policy. Local tribunals and legislations will have jurisdiction over the access of your personal information. Upon written request and subject to proof of identification, you may consult the personal information that we have collected, used or shared, as required or permitted by law. Accessing the personal information contained in your file and rectifying such personal information is free of charge. However, a small fee may be required, upon notice from us, to cover the costs of processing such requests (e.g. the cost of photocopies). We will attempt to process your request to access or rectify your personal information within thirty (30) days of receipt thereof. If we are unable to respond within this time, you will be notified. We make every effort to keep the personal information in our possession accurate, complete, and up to date. However, you are in the best position to quickly inform us of any changes to your personal information, and we therefore ask you to inform us of any required amendments. At any time, you may request that the appropriate corrections be made to the personal information that we hold about you. If applicable, we will forward the amended information to the third parties that have access to your personal information. We undertake to follow up on every comment, question, request or complaint. This Policy is subject to amendment to account for the rapid evolution of the rules pertaining to protection of personal information and privacy. This version was last updated on July 1, 2015. The information posted on this site is provided by Transat as a service and is intended to be used for informal purposes only. The information, including text, graphics and hyper links, are provided "as is" and "as available." Users shall be entitled to copy or download the information posted on this site only for their personal and non-commercial use. Information posted on this site may be updated at any time, without notice. Transat does not warrant the adequacy or completeness of the information posted on this site and expressly disclaims liability for errors or omissions in this information. No warranty of any kind, implied, express or statutory, including warranties as to non-infringement of intellectual property rights or third party rights, is given in conjunction with the information. In no event will Transat be liable for any damages arising in connection with this site, the information posted thereon or its use thereof. All texts, images, photographs, information, audio clips, video clips, software and codes available on the Sites, including the presentation of the Content and the Customer Content (defined below) (collectively the “Content”), are protected by Canadian and foreign laws, including copyright laws, and belong to TTC, its affiliates or its licensors. TTC grants you a non-exclusive, non-transferable license to use and display the Sites and their Content on your computer, mobile phone or any other electronic device, solely for personal and non-commercial use, and to make one copy, for backup or hard copy purposes, on condition that you do not alter their Contents and that you retain the copyright notices. The modification, reproduction, distribution, transmission, dissemination, representation, networking, marketing, publication, licensing, public performance, downloading, creation of derivative works, internet posting, sale or any exploitation of the Sites and their Content are prohibited. The use of software, applications, computer programs, automated scripts, macros, spiders or other “screen scraping” software, robots, “bot” or any other technical means or device to copy, extract, aggregate, store, distribute or manipulate the Content on the Sites in order to engage in data mining or processing, “screen scraping” or in order to reproduce and/or display the Content on the Sites on any other website or online service without TTC’s prior written approval is prohibited. All the software integrated into or included on the Sites, including all files and/or images contained in or generated by such software, is protected by copyright and may be protected by other rights as well. Such software belongs to TTC, its affiliates or its licensors. You may not: (i) use, reproduce, modify, adapt, translate, download or transmit the software, in whole or in part; (ii) sell, lease, rent, license or transfer the software or otherwise allow access thereto; (iii) alter, remove or cover any trademark or notice of ownership included in the software; and/or (iv) decompile, disassemble, decrypt, extract or reverse-engineer the Sites and its components, including, without limitation, the software, or assist anyone to do so. You acknowledge that you do not hold any right, title, interest or license to or in the software integrated into the Sites or that may be downloaded from the Sites. Some parts of the Sites require registration. If you opt to register for this part of the Sites, you undertake to provide true and up-to-date information regarding yourself, as required by the registration process, and to update this information promptly to ensure that it remains accurate and complete. You acknowledge that you are responsible for (i) maintaining the confidentiality of the passwords you choose or that are assigned to you following your registration; (ii) any activity carried on under your user name or under your password; and (iii) exiting your account at the end of each session. Moreover, you undertake to notify TTC of any unauthorized use of your user name or your password. If you fail to comply with the obligations set out in this clause, TTC will not be liable for any resulting losses or damages. The Sites may offer you functions that allow you to submit messages, comments, data, texts, software, music, sounds, photographs, images, videos and other materials (“Customer Content”) to TTC and to interact with TTC, its employees and agents, and other users of the Sites. When you submit your Customer Content to TTC for posting on the Sites, you grant TTC an unrestricted, irrevocable, non-exclusive, perpetual and royalty-free worldwide license: (i) to use, reproduce, store, adapt, translate, modify, create derivative works from, transmit, distribute, publicly perform or display your Customer Content for any purpose whatsoever; and (ii) a sublicense to third parties who have access to the Sites for the unlimited right to exercise one of the aforesaid rights. In addition to the granting of the above license, you hereby (i) agree to waive all moral rights to the Customer Content in favor of TTC; (ii) consent to your name, address and email appearing for your Customer Content, where applicable, and to the disclosure and/or display of such information; (iii) acknowledge and agree that TTC cannot be held liable for any loss, corruption or damage to your Customer Content; and (iv) acknowledge and agree that the Customer Content you provide for display on the Sites or that you submit to TTC will be considered non-confidential. Moreover, TTC will have the right, but not the obligation, to use, without any compensation, any idea, any concept, or any know-how revealed in the Customer Content, for any purpose whatsoever, including the development and marketing of new services. By submitting your Customer Content to TTC, you represent and warrant to TTC that: (i) your Customer Content is original; (ii) the Customer Content does not infringe any intellectual property right; (iii) you are the sole holder of all the intellectual property rights to the Customer Content or, as the case may be, you have obtained the holder’s written permission to submit the Customer Content; (iv) the Customer Content does not contain any defamatory comment or any obscenity and does not violate a third party’s privacy or publicity rights. The Sites contain hyperlinks to third-party sites (the “Third-Party Sites”) which cause you to exit the Sites and which do not belong to TTC. TTC provides these hyperlinks for your convenience. The Third-Party Sites are not under TTC’s control and the hyperlinks shall not be interpreted as an approval or an endorsement of their Content by TTC. TTC is not responsible for the content of the Third-Party Sites, the links contained thereon or the changes or updates thereto, and TTC offers no warranty in this regard. The Sites and their Content are provided “as is”. You use the Sites at your own risk. TTC makes no representation or warranty regarding the Sites and their Content, including, without limitation, any warranties pertaining to (i) the merchantability or fitness for a particular purpose of the Content or the non-infringement of intellectual property rights; (ii) the safe, uninterrupted or error-free operation of the Sites; iii) the Sites meeting your needs and expectations; (iv) the accuracy, completeness, reliability or relevance of the Sites and their Content; (v) the correction of defects or errors on the Sites; (vi) the absence of viruses or harmful elements on the Sites. TTC, ITS AFFILIATES AND THEIR DIRECTORS, EMPLOYEES AND AGENTS MAY NOT BE HELD LIABLE IN ANY CIRCUMSTANCES FOR DAMAGES OF ANY NATURE, WHETHER INDIRECT, SPECIAL, CONSEQUENTIAL OR INCIDENTAL, RESULTING DIRECTLY OR INDIRECTLY FROM THE USE OR PERFORMANCE OF THESE SITES OR THE CONTENT THEREOF OR OF ANY SITE WHICH YOU ACCESS VIA THESE SITES. TTC, ITS AFFILIATES AND THEIR DIRECTORS, EMPLOYEES AND AGENTS DISCLAIM ALL LIABILITY FOR THE ACTS, OMISSIONS OR CONDUCT OF ANY THIRD-PARTY USER OF THE SITES OR OF ANY ADVERTISER OR SPONSOR OF THE SITES (“THIRD-PARTY USERS”) AND MAY IN NO CASE BE HELD LIABLE FOR ANY LOSS OR DAMAGE (INCLUDING, WITHOUT LIMITATION, SPECIAL, INDIRECT, CONSEQUENTIAL OR INCIDENTAL DAMAGES) OR COSTS ARISING IN ANY MANNER (I) FROM THE ACTS, OMISSIONS OR CONDUCT OF A THIRD-PARTY USER; AND (II) FROM THE USE OF OR INABILITY TO USE ANY SOFTWARE, CONTENT OR SERVICES OF THE SITES OR OFFERED THROUGH ANOTHER SITE LINKED TO THE SITES. In the event that you purchase travel services on the Sites, you must provide complete and accurate personal information. TTC reserves the right to accept or reject your booking, at its sole discretion, at any time following the receipt of such booking. You acknowledge that the price of the travel services posted on the Sites may change without notice and that the travel services are conditional upon availability at the time of purchase. TTC reserves the right to change the prices of the travel services offered without prior notice in order to correct them, namely further to a computer or data-entry error, and to reject, correct or cancel a booking or purchase by a user of the Sites of travel services at an erroneous price, without incurring any liability. Unless indicated otherwise, your purchase of travel services on the Sites is governed by TTC’s general conditions as stated thereon and by the applicable tariff of the air carrier providing the air travel service. AIR TRANSAT, AIR TRANSAT KIDS CLUB ENFANTS AND DESIGN, CLUB AND DESIGN, OPTION PLUS, THE TRANSAT STAR AND THE TRANSAT MOSAIC and TRANSAT, are trademarks of Transat A.T. Inc. used under license by TTC. Other names, words, titles, phrases, logos, drawings, graphics, icons and trademarks displayed on the Sites may be registered or unregistered trademarks of TTC or third parties or used under license by TTC. You may not use any trademark appearing on the Sites without the written permission of Transat A.T. Inc. or the holder of the rights to such trademark.